I saw this little grey coupe turning left at the light a few cars ahead of me, and was pleased as the proverbial punch when I looked down the street to see it parked at the curb. I had to turn around and check it out. I caught the rear view first, of course, and was trying it against the template of several small cars from postwar Europe you see every once in a while. Was I going to see some kind of crazy Borgward or something? But when I saw the front, I knew that my spot was something perhaps less rare, but just as much fun. 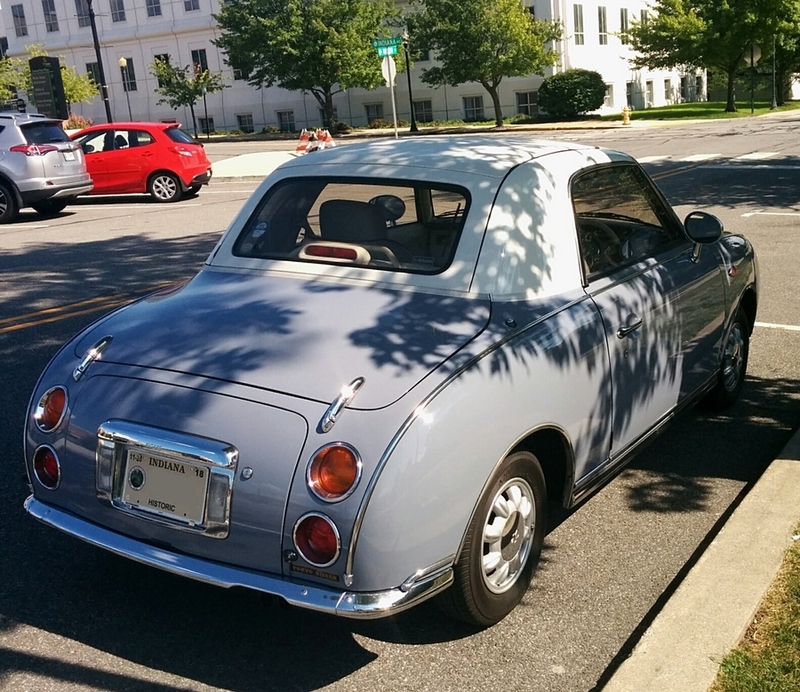 It’s a Nissan Figaro– the first one I’ve even seen in the wild, but from what its owners told me, probably not the last. 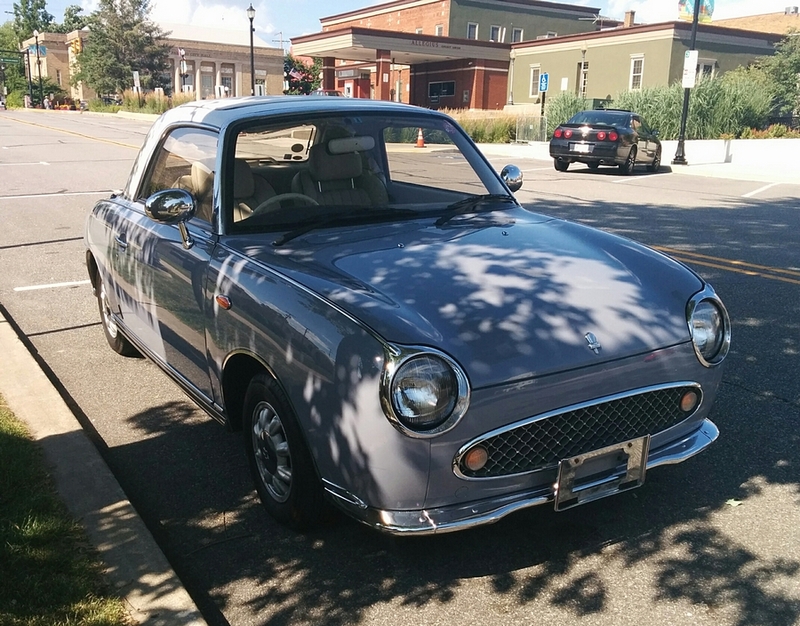 The Figaro is one of four niche model “fashion cars” built by Nissan in the early 1990s in the chassis of the March/Micro small car. (The others were the Be-1, which was sort of like an Austin Mini, the Pao, a tiny “rugged wagon”, and the S-Cargo, a sedan delivery with a snail shape.) Figaro, of course is a Euro style retro coupe. It was built only in 1991, and while it was quite popular in Japan, it was Not Sold Here at the time. But time goes on, the 25 year limit has passed and now these cars can be imported to the States as classic or historic cars. The owners of this car report that the dealer where they got it had more than a hundred Figaros for sale, ranging from daily drivers to minty examples ready to be prepped for show. Theirs, they told me, was somewhere in the middle. Ranking this spot is a work in progress. A few years ago this would have been a 10, with the extra point for Not Sold Here. I think with the new availability, we have to take that point away, so lets call it a 9 points for an extremely attractive and interesting car we rarely see, but not a true unicorn. One of the fun things about old or imported cars are the cool stickers and badges left on them from their first life. Check out the “Tokyo Nissan” dealer badge under the curb side (driver’s side!) tail light. 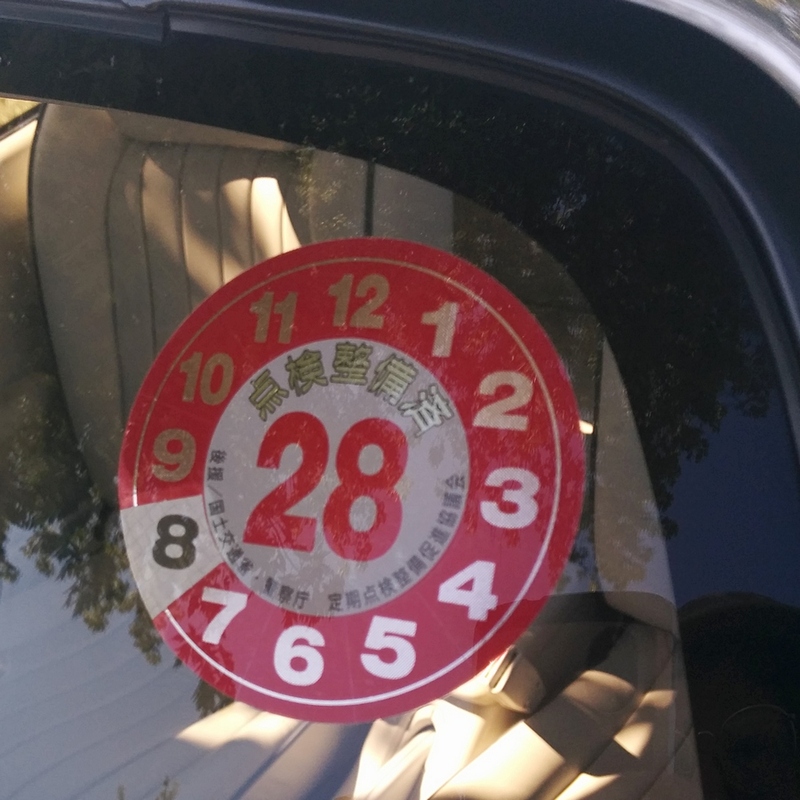 This sticker was on the passenger side of the windshield. 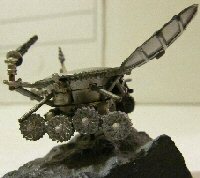 This entry was posted in art and culture, photography, writing and tagged cars and car spotting, photography, writing. Bookmark the permalink.